We are offeringUV Spot Coating Machine to our clients. 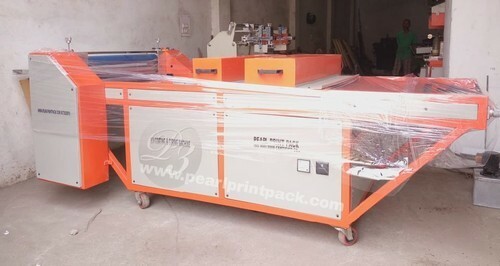 We, Pearl Print Pack started in the years 2009, are one of the foremost manufacturers of a comprehensive consignment of UV Curing and Coating Machines. Our offered range consists of best grade Halmet UV Curing Machine, Hot Air Drying Machine and UV Coating Machine. Designed by the use of top grade material and new technology, these are available in several specifications as per the requirements of customers. Apart from this, owing to their high performance, durability, easy installation, and sturdy structure, this machines ranges are highly appreciated among our patrons. Our state-of-the-art infrastructure unit has new technology machines. This helps us to cater the bulk requirements of our prestigious patrons. Together with this, we have a team of talented professionals which work dedicatedly to provide our patrons with a quality approved product range which is in compliance with the client’s given specifications. Also, we deliver UV curing and coating machines range within the assured time frame. Apart from this, the customized option is offered, keeping the ease of our patrons in mind.